No injuries are associated with the defect found in 2009 and 2010 Chevy Impalas. WASHINGTON (Bloomberg) -- General Motors Co. is recalling 303,100 Impala cars in the U.S. because seat belts in the front seat may not be properly anchored and may not restrain passengers in a crash. The company will reinstall seat-belt anchors in the Impala for model years 2009 and 2010 that have the defect, according to a letter on the National Highway Traffic Safety Administration Web site today. No injuries are associated with the defect, which GM discovered through warranty reports, he said. 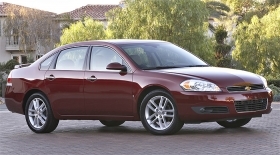 DETROIT -- General Motors is recalling 322,409 Chevrolet Impalas from the 2009 and 2010 model years to inspect for a small number of vehicles whose front seat belt webbing may not have been properly secured to the lap belt anchor pretensioner mounted to the side of the seat nearest the door. Vehicles with this condition may have an anchor that can separate in a crash, and therefore may not meet the anchor strength requirements of the U.S. and Canadian Motor Vehicle Safety Standard that covers seat belt assembly anchorages. Dealers will inspect both front seat belts for proper installation of anchors to pretensioners and, if necessary, reinstall the anchors. GM knows of no injuries or deaths related to this condition. Customers will be notified on or around Oct. 25 by mail to bring their vehicles in free inspection. Any repairs related to this condition will be done free of charge.